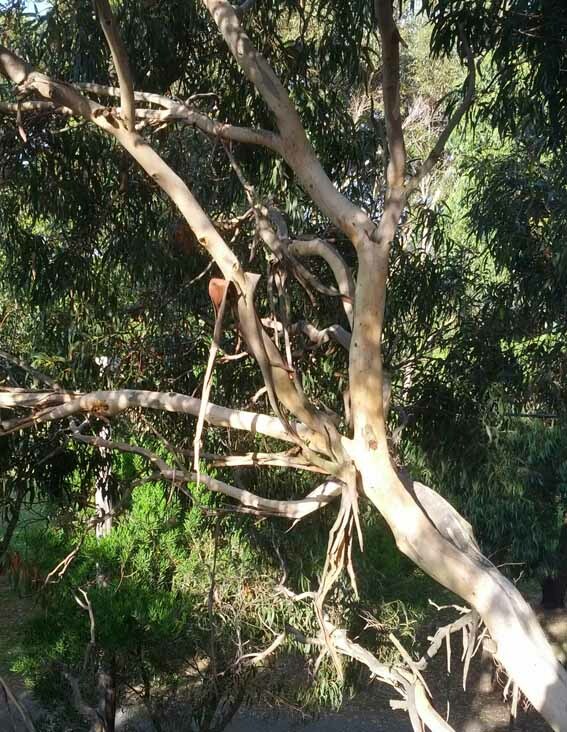 I STROKE the branch of the coastal gum which leans over a corner of our deck. The breeze moves it around causing it to feel like a horse or a boat moving at the end of a rope. This branch has a scar on its underside where it used to sway and rub against the tall deck pole when the wind got up. The rubbed bit is dry, rough and brown and reminds me of a healed up abscess. The bark I am feeling is smooth, cool and almost muscular. It could be an arm, an arm of the tree waving and stretching up into the sky and light. We sited our house at Cape Paterson around some medium sized trees and since being given shelter from the winds by the house, they have grown, stretched up and opened out. We used to have foliage at the upstairs windows and now there are sinewy, slender branches to look through. 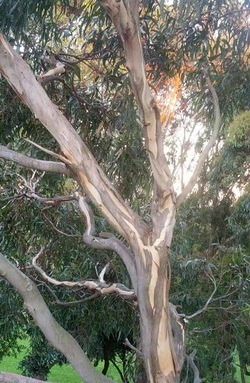 The bark is a soft creamy colour, with flecks of impressionist green and grey. Sometimes there are long smudges of cream, sometimes a dangling strip of darker discarded bark. I love this type of gumtree bark which also appears on river gums. I love the soft calmness of the colour, the irregular streaks of the cream, green or grey and the contrast of the burnt dark brown of scar tissue. We sit on the deck and the trees sway around us. We are up with the birds which fly in to feed off the insects on the leaves. We can look the huge crow in its yellow eye before the wattlebird comes to harass it. The butcher bird has a lot of confidence and seems to think that we are there to feed it. We don’t but it still sings its piping song. Once we looked down on a koala which had settled into the fork of another tree. Only the other night we startled the possum which plods heavily across the bedroom roof. We had turned the deck light on, opened the door and saw the possum on a near branch, crouching and staring hard at us. When we stepped forward, it stood up, retracted its lips and hissed at us before leaping off into the night. It feels an honour to be up in the tree tops. LIZ LOW was privileged to meet one of her fellow creatures in the Cape Paterson sand dunes. EASTER Saturday at Cape Paterson was fine and clear and Second Beach was just asking to be visited. I’d not been able to walk on anything other than footpaths for the past few months following my hip replacement in the middle of January. A whole summer had passed me by while I gradually built up my strength and flexibility. 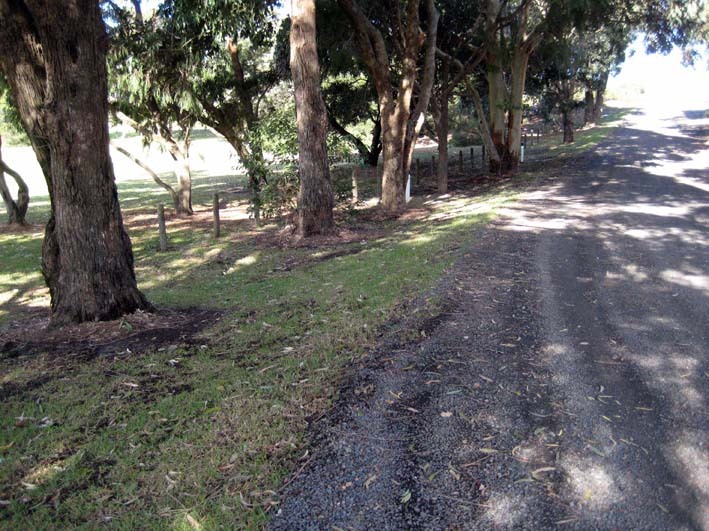 The path to the beach stretched and wound between the banksia and tea trees. My legs and hip were able to walk on the soft uneven sand with enjoyment. The familiar dune vegetation honey smell hung in the air as I followed the path up to the top of the dune. There in the distance was the ocean, blue and bright, at the end of the stretch of green trees and bushes that the path threaded through. I was so happy to be on that soft, sandy path and even happier to reach the peak of the actual beach dune looking at the waves and water spreading to the horizon. My family ran down the dune to the beach. I was very content to stay up there. I found a comfortable sandy slope where the sand had invaded and filled up the old viewing platform. The sand was warm under my back. Down below, the surfers quietly sat on their boards, apparently with no waves worth catching. The waves rolled in steadily and calmly, a few people walked along the beach. I watched some gulls flying towards First Beach and heard only the gentle roar of breaking waves. I turned my head to the side. A snake, stretched half out of the low bushes, was looking at me. I saw its sloping, scaly face low and front on. I could see its wide mouth and lips. Its tawny body was about as thick as my wrist and its stripes gleamed in the sun as if they’d been varnished. We looked at each other for about a second. It turned its head and slid back down along its body to return sleekly to its green protection. There I had been! On my back, only about a metre and half away from a tiger snake, low enough to have looked it in the face. There, I was! Still there, but sitting now and looking at where the snake had been. I wasn’t frightened, more amazed and excited. It’s not often you get the chance to look at a wild snake from its level. We had each wanted to lie on the warm sand and I would have been quite happy to share the space with it if it promised to come no further. Unlikely, I know. Usually, I’m very frightened of snakes when I come across them on a path. The speed of their quick flick away intensifies that fear of how fast and powerful their strike must be. This time, perhaps it was the quietness of the moment that made a tiger snake of about a metre in length seem interesting and not threatening. and deadlines. LIZ LOW argues that a meandering dirt road offers relief. ONE day earlier this year, we opened the mail to find that Bass Coast Shire Council, under Special Charge Scheme No. 27, planned to charge us $32,700 to seal, concrete curb and channel our dirt road and lay a concrete footpath. About 450 houses in the heart of Cape Paterson have been similarly afflicted because we choose to live on the original unsealed roads. Since then, I’ve been thinking a lot about why I love dirt roads. We were very pleased to find a block of land on a dirt road. 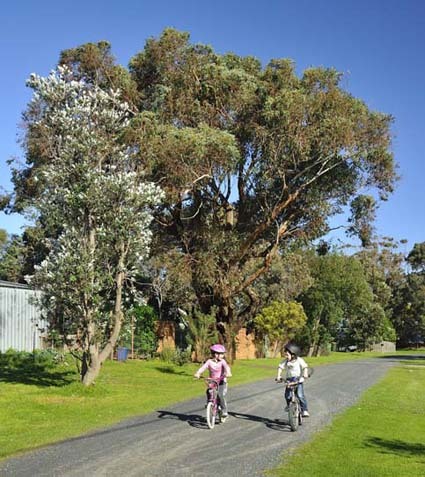 We didn’t want to live on a suburban-style subdivision with a vista of dark grey asphalt, white curbs and white concrete footpaths, white concrete driveways and neatly mown grass nature strips planted with trees at measured intervals. We didn’t want the rigid geometry and hardness of such a scheme. We wanted the irregularity of gravel merging into the surrounding soil and vegetation. We wanted remnant trees from the original subdivision to remind us of the land as it was before us. We liked the large overgrown planted trees and gardens which sprawled onto the roughly mown grass stretching to the edge of the gravel. We liked the natural curves of vegetation and road and the lack of a single straight line. Our lives tend to be dominated by metaphorical straight lines: rigid timetables, appointments and deadlines from which we have little escape. Coming home to the informality of a dirt road offers a rest from structure. It’s a clear marker of change and the opportunity to refresh and rest. There’s a visual quietness about a dirt road. If you’re lucky enough to have local gravel, it sits softly in the landscape, almost merging into the land from which it came. Imported gravel soon settles with rain, fallen leaves and use. 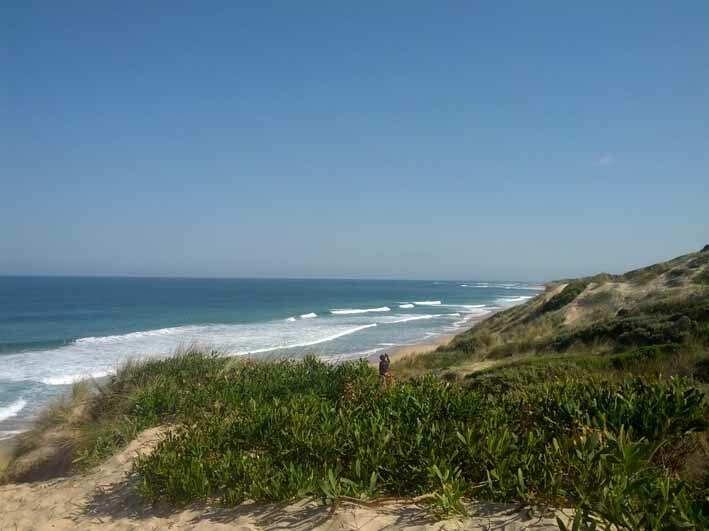 Bass Coast councillors must decide whether to declare a special charge scheme for Cape Paterson. If they do declare the scheme, it will not proceed if a majority of owners oppose it. On our road at the moment, I’m enjoying walking across smooth old crushed bricks emerging through the top layer of gravel and wondering about where they came from and I’m pleased that they have been reused. There’s a connection with the earth and a suggestion of old paths walked by many feet. Our dirt roads are shared. Families walk on them to the beach, kids practise their bike skids, people ride bikes to the shop, the beach and their friends’ houses. Dogs get walked, prams get pushed and cricket games are played on the quieter roads. Cars travel slowly on the dirt surface as they expect to share the space. Walkers feel safe because the crunch of gravel gives plenty of warning of an approaching car. I like living on a dirt road because it brings back memories of playing on the road back at Eaglehawk. Our house was on a curve and there was a wide sweep of ‘non-road’ on the outer curve which gave us a gently sloping gravel playing area. In summer, we would play cricket out there till we could no longer see the ball, and in winter, a seemingly endless game of kick the kick with a sodden bloated football. 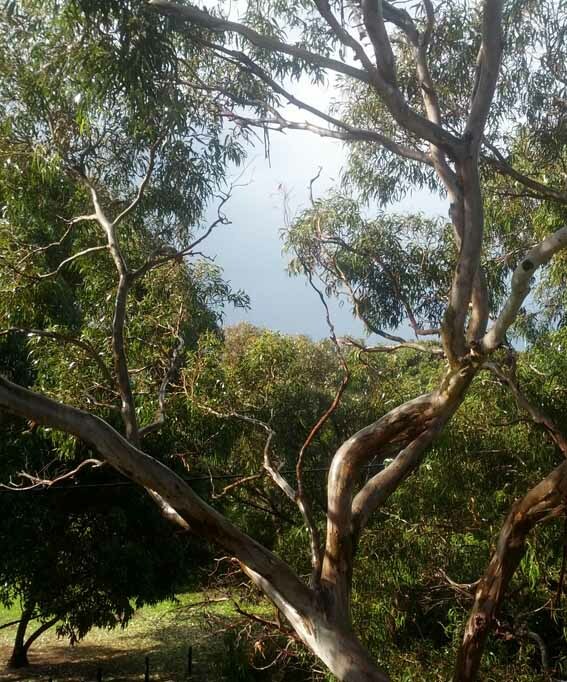 Years later, as parents of young children, we sought refuge from the hot footpaths and sealed roads of the inner suburbs and chose to live on a dirt road at Warrandyte for twenty four years. Again, I loved the informality, the safety of slow driving, and the sense of sitting softly in the environment. There, actually more so than here at Cape Paterson, with summer, came the dust. A cloud would rise after each infrequent car passed and would hang in the air before it settled on the roadside bushes and occasionally, inside. I feel sorry for the plants but that’s summer, it’s just part of what the season is about. And with winter, rain will come if we’re lucky and the leaves will be rinsed off. Roads will damp down, some puddles appear, water will soak into the soil and replenish the groundwater. Some roadside drains will fill and not empty immediately but they generally dry out before too long. We’re built on sand here and usually no water lies around for very long, especially if the council maintains its surface drains regularly. There’s a pleasing feeling of the roads looking after themselves and the environment without too much bother. We love our dirt roads because there is a sense of fit with their small, quiet village environment. They are calming, aesthetically pleasing and safe. Rural councils can use special charge schemes to standardise all roads to a “one size fits all” urban model. However, small coastal communities have a particular character which should be respected, valued and preserved. The fear is that one day these special neighbourhoods might be declared extinct. One of the reasons I wanted to move to the country was for the slower pace of life and the relaxed atmosphere. I believe dirt roads are a catalyst for both. As Liz Low says, cars drive more slowly on dirt roads and people are more inclined to meander along them in the hope of discovering something, perhaps, like “old crushed bricks”. I get excited when I find some of the red rock (burnt clay?) that was used for early Wonthaggi road building, when I dig up a new garden bed! I possibly shouldn’t advertise this but in protest against straight lines and uniformity, I have created “Dowbrook Meadow” on my nature strip! Mind you, I do have a very nice, wide mown strip around the meadow, and the solitary tree, to ensure that walkers and dogs wishing to leave messages for their mates are not impeded. 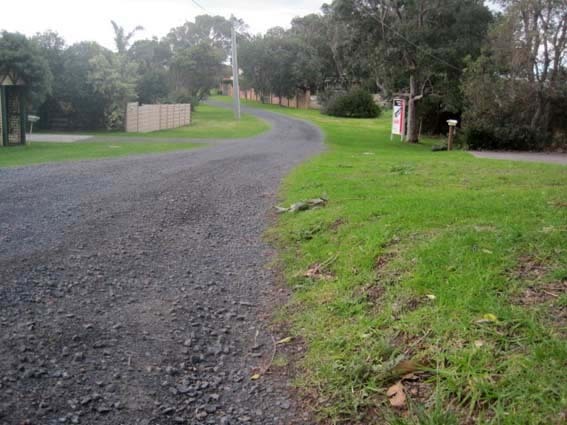 I despair when I hear locals saying dirt roads are a nuisance because I, for one, would hate to see Wonthaggi turn into nothing more than a “suburban-style subdivision with a vista of dark grey asphalt, white curbs and white concrete footpaths, white concrete driveways and neatly mown grass nature strips planted with trees at measured intervals”. When I was a child, my late father (Ernie Asquith) spread red stone, carted there by Freddie Webb, I believe, out at Cape Paterson on the unmade tracks and they turned them into the original roadways is my memory. Not sure if he acted along or there were other contractors. I also have memories of the older part of North Wonthaggi running off Gordon Street with the open unmade roadside and clearing the drain with a tractor and dredge thing. Dad would return in the evening to light the red lanterns so that people walking and driving wouldn't come to grief - we often went with him for company.